I’m enough of a geek to notice my Technorati ranking dropped 300 slots today, a negative change of about 25%, which is the blogger equivalent of Black Monday. And indeed, just as that particular crash was caused or at least abetted by technology, so too mine: Technorati assigns rankings based on links to blogs over the previous six months. A big one day change suggests that six months previous there was something on Whatever that was heavily linked to, and now those links are expiring, from the point of view of Technorati. So I thought to myself: what was I doing six months ago that was so all-fired popular? So I looked. Also: Damn, that doesn’t feel like six months ago. Time is moving just a hell of a lot faster these days, and that’s all I’m going to say about that. Also, I clearly do need to step away from the computer more often. If you have to hide the Olympic Torch while ostensibly displaying it, you’re doing it wrong. What “it” is in this sentence I’ll leave evocatively undefined, and for you to fill in for yourself. The way we’re mixed: Krissy is an iPodder, whereas every media player I’ve owned has been something other than an iPod: Three Creative players and the current Archos 605. This is because I don’t like paying a premium to be trapped in the Apple ecosystem as a general principle, and also because I have a Rhapsody subscription and have lots of rented music off the the service, which the iPods won’t play because Steve Jobs is a butthead. Whereas Krissy doesn’t care about any of that, she just wants something small that will play music. Thus, her shiny new iPod Nano, which is tiny tiny tiny — see it here next to my Archos, which while only slightly larger than a first generation iPod looks monstrously obese next to the Nano, which reminds me of nothing more than an overgrown Chicklet. It’s pretty, but personally I would be genuinely terrified of losing it. I can’t find my keys half the time, you know, and this thing is more expensive than my keys. The fact is the current race for the tiniest form factor possible for electronics doesn’t really do much for me. I’m too forgetful to benefit from it. The Archos is not exactly huge, but it’s large enough in size and weight that I don’t fear losing it when I set it down. Our respective players also exhibit our philosophies regarding what we want out of our player. When Krissy’s first generation iPod Mini finally croaked, I asked her if she wanted to replace it with an iPod Touch, and she looked at me like I was wearing a suit made of mustard. Why would I want that? She said. I just want to play music while I exercise. She doesn’t give a damn about wifi connectivity, playing movies or games, or any of that crap. 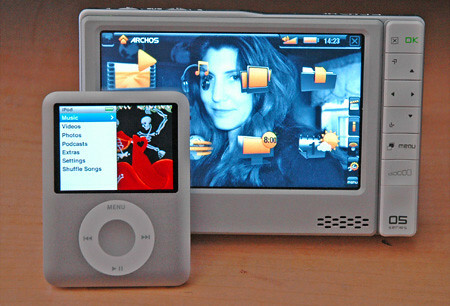 The current Nano is actually probably over-featured for her in this respect, because it plays movies and games and shows photos, and none of those features is ever likely to be used by her. Naturally, I think this is madness. The Archos has wifi, an 800×480 touchscreen, the ability to play movies and other media, and (this is why I got this particular model) 160GB of memory. It’s got my entire music collection and a couple dozen movies on it and it’s not even close to being full. I think that rocks. I mention this to Krissy and she gives me a pleasant but blank look that says I know you are communicating something you are enthusiastic about to me, but I really couldn’t care less about it; nevertheless I love you. It’s a tolerant look, actually. She knows the geek moment will pass and we can get back to our lives. The point is our media players do tell you a little about us. Anything important? No; but still. You take your clues where you find them. Back from the dentist, and the owner of three new fillings. I forgot I had more than one cavity. My dentist, however, did not. The novocaine is slowly wearing off, and I’ve taken preemptive ibuprofen to ward off the inevitable general pain that comes from a grown man and his dental assistant rooting around in one’s mouth for an hours plus change. My dentist, well aware of what is either my somewhat high resistance to novocaine or my low resistance to pain brought on by high speed drills on my teeth, shoots me up pretty heavily with the stuff. For this he shall be rewarded in Heaven, although the flip side is that I spend a few hours afterward feeling like half my head is an insensate lump of hamburger. But given that or drill pain, I’ll go for the hamburger. I’ve also just self-administered some ice cream. Because ice cream helps everything. I’m off to the dentist! To have a cavity filled! Go me! Console me with tales of your own most recent dental appointments. Did you escape unscathed? Or were your forced, like me, to return at a later date to atone for those missed brushings?